Debut novel, published by Aschehoug Forlag in Norway, January 2010. Literary rights sold to Sweden, Denmark, Finland, Germany and Russia. Movie rights sold. Theatrical rights sold to Finland (Theater of Kemi). Roy Aasen and Leif Samuelsen are good friends and true slackers. They are also colleagues in the local post office in the tiny town of Kirkenes, at the border to Russia and Finland, far above the Arctic Circle, in the northernmost region of Norway. They are dreaming of a life with less work and more money, and are constantly trying to come up with get rich quick-schemes. And one day, they have an idea: What about building a camp in the woods, where tourists can live like the indigenous Sami people for a day or two? Dress up in Sami clothes, sleep in lavvos and throw lassos at reindeer? A gold mine, for sure! Never mind the fact that they have absolutely no knowledge of or insights about the Sami culture. So they set out to create Samiland, and along their way they encounter amongst others, a Sami-hating, flag pole dismembering bureaucrat, an angry Finnish souvenir-salesman, a money transport robber, a vodka-selling Russian seaman, a disillusioned Sami reindeer herder, and a beautiful woman. Opening day is drawing closer. 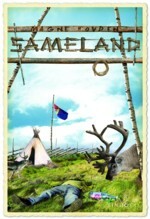 Will Roy and Leif be ready to welcome Samiland’s first visitors?